You must remember that my Rotary experience so far has been to attend the annual leadership program wrap-up and attend a bunch of breakfasts where I am slowly getting to know some great guys. I have been hearing about various things we do in our club, but my actual participation has been very limited so far. On arrival at the pavilions I was quite impressed by how many people were involved (and attended) given that the district covers only from Casa Grande on down. I was also heartened to see that a lot of work was obviously put in to have good tables with food and signage, etc. (Having been involved in other nonprofits, the obvious level of engagement all around kind of jumped out at me.) Before long, my friend and I were welcomed and engaged in conversation by several people starting with Chris Bijsterveld, my fellow Casas Adobes member who was very kind to me and my friend in making us feel connected to the group. He introduced us to Ernie Montagne, who welcomed me as a new member. Ernie then went on to tell me about the Ride for Polio, the polio eradication effort, which had come up in a few of our club breakfast meetings. I didn’t quite connect the dots on this event until Ernie laid it out for me. By the time he was finished, I was almost speechless that one man, Michael Harris, kicking off a polio effort with a single bike ride, had managed to embed that effort into the worldwide organization, which took it up to such an extent that untold millions of dollars were raised. When Chris told me later that Michael Harris has a trophy honoring him at the international headquarters – and that he is from our very club – that was the start of what I will call my “golden moment of awakening”. I got double-punched in the Saturday breakfast presentation by Doug Jackson PhD., prominent Rotarian and the president of Project Cure. He highlighted the close supporting connection between Rotary and Project Cure and showed how it went from his father’s idea out of the back of a pickup to become a complex of giant warehouses and distribution networks for moving donated medical supplies today largely due to the Rotarian support connection. The speaker who followed, and the speakers in two of my breakouts all focused on child development and abused child issues which I have always felt are kind of a ground zero target for charitable work. In the end, I came away with a profoundly expanded view of Rotary as an enormously effective global organization of which I am very proud to be a member. 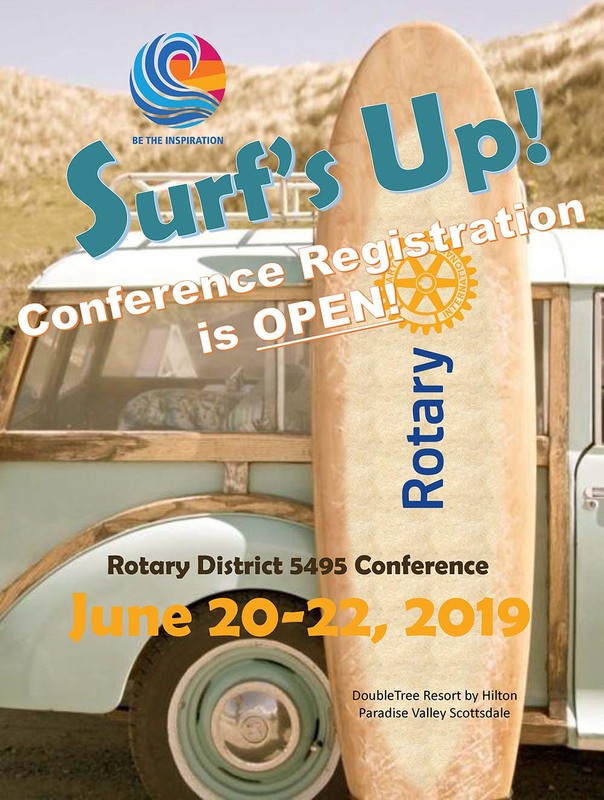 The breakouts, keynotes, and the social interactions with many great people with great stories who I had not met before all brought Rotary to life for me in a new way. This organization can raise millions in a single day and deploy armies of smart, capable and motivated philanthropists, along with equipment and supplies anywhere, to do virtually anything, by the sheer will and commitment of its members to the concept of service above self. And for the first time I got a strong sense of belonging to a family that extends far beyond my local club into the global family that is Rotary. In my search for involvement with a worthy benevolent organization, attending the conference made me feel, simply, like I had arrived home. If I want to change the world, this is the organization where I believe I can make that happen. I can’t recommend enough that every new member should attend the next district conference, to really “get it”.